To build excellence, we have to lead in a way where we encourage effort. Since there are no inherent abilities, we can substitute effort to build ability. So, have the courage, persistence to outwork your competitor. 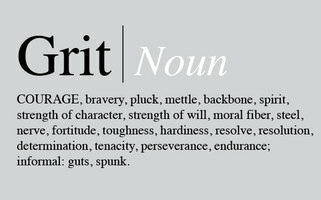 Have the desire & attitude to excel in your undertaking…simply have grit. We resist investing in building environments that inspire and create leadership, philosophy and opportunity. Risk needs to built into our DNA. And new ways of playing the game need to be fostered. Find and stick with grit with people who have a winning attitude. Wean off negative energy immediately – it will get to you sooner or later. We are slaves to instant gratification. Remember, there is a lot you don’t know. Keep learning. Develop an unending quest for knowledge and grit to obtain it. Learn from the best and apply your knowledge to develop a competitive advantage. World class performers are always looking for world class coaches.